Lisa is the 15 year old daughter of a pen pal of mine, who resides in Pennsylvania. Here is the story of Lisa's hunt. Congratulations and way to go Lisa! 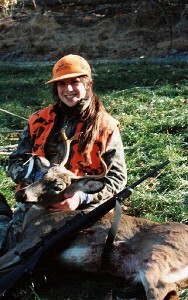 The first deer my mom and I saw in rifle season was a fork buck on opening day. He was on a brushy hillside, walking towards us. He stopped, took one look at us and decided we weren't the type of gals he'd like to hang out with. I promised myself that I would get that buck. We walked on, hoping he would slow down, and give us another chance. As we sat down to lunch we heard around seven or eight shots and I heard some horrible bawling from that direction. After that I didn't feel like eating. I was sure it was the buck. We slowly made our way towards the area the shots came from. After a while, we came to a father and his son. They were dragging the doe they had just turned into Swiss cheese. The father had shot around five times and the doe just stood there, then the son shot a few times and the deer finally dropped. The rest of the day went by without an incident (except for sore feet and frozen fingers). The next morning, mom asked me were I would like to go. I suggested that we go were the father and son sat when they got their doe. When we got there we sat down in the well cleared area. It didn't look too promising but I had a feeling we were going to see something. I was picturing a beautiful doe walking on the hill, and then a victory shot. Five minutes passed and I was listening very carefully when I heard something. Faint but distinct, the crash, crash, crash of a number of deer. In my mind was, no, can't be, not this soon. But where was it coming from? Slowly I turned my head and looked behind us. I was shocked to see fifteen or more deer walking past us in the brush at about seventy five yards. I used my favorite grunt call, locally made. It must have been made especially for the local deer, because they angled right back. They passed us again, this time at around seventy yards. I called with the grunt and again they angled back. Sixty yards in front of me was a small clearing and in front of that was a large one. As they passed through the small clearing I looked them over to choose the deer I would shoot. At the end of the line of does, one deer stood out and looked strangely familiar. It was the buck I saw on opening day. The buck I declared that I would get. What a chance of a lifetime for me! My gun was ready, the buck was in the clearing. With my voice I went "Baa". He kept going. A louder"Baa". Still going. "BAAA". He stopped, with his heart and lung section behind a tree. Well, the ribs are good enough. My heart was pounding as I took careful aim. I shot and the buck leaped in the air. He took a few steps into the brush and just stood there. Mom, who hadn't moved an inch since she saw me raise my gun, now turned to see deer scattering everywhere. She spotted my buck in the brush and didn't want to chance letting it get away. She took a shot, but a sapling deflected her bullet. The buck was spooked by the shot and ran fifteen yards and fell down. I had gotten my first buck and a brow tine had made it a five pointer. I decided to mount the head of my first buck semi-sneak and looking to the right, the way I had first seen it on opening day.